“I like the music of the golden age, its rhythms and variety of moods”. 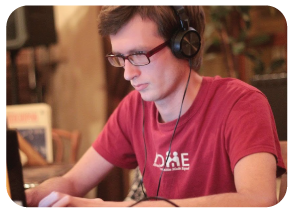 Nick has been DJing for more than 2 years at regular Kiev milongas, as well as festivals. We heard Nick on a hot summer day at a Minsk open-air milonga when he was travelling via Belarus. We liked his DJing a lot! And during a conversation we asked him to come and play at our festival. He was really great at feeling the atmosphere and the mood of milonga.